D&D 5E, Pathfinder, Savage Worlds, and Starfinder! 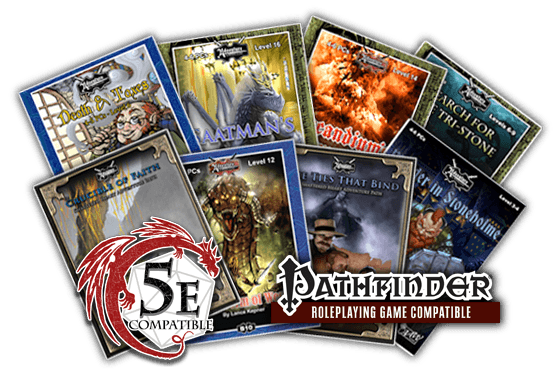 200+ products for Dungeons & Dragons 5th Edition and 350+ products for the Pathfinder Roleplaying Game. Our adventures are written by industry professionals and score consistently high ratings on DriveThruRPG and Paizo. Find out more! Over 500 maps in GM, Player, and VTT for our subscribers. Maps by 3x ENnie award-winning cartographer Todd Gamble (Forgotten Realms, D&D 3.5 books) and Tommi Salama (Snow White, Rise of the Drow). Find out more! From the frontier village of Rybalka to the deepest depths of the drow controlled Underworld, the Aventyr™ Campaign Setting is waiting for adventurers like you to hold back the tide of evil! Find out more! If our adventures and maps weren't enough to make you swoon we also sport a fantastic audio soundboard, online PDF flip-books, Tales from the Tabletop webcomic, and an ENnie award-winning blog! Find out more! During the spring of 2013, I found myself with time and energy to start a new group, I had several books for the system in question, but I found myself needing something more than the official version. I needed bits of seasoning for the campaign I had laid down, that’s when I found AaW.com. A site full of adventures written by amateurs and professionals; that would give me the input I needed, how others used bugbears in their adventures and so on, you can access anyone of the adventures on the site online, and you get to download two PDFs every thirty days to keep. Since I joined the site has evolved into a treasure trove of adventures, as well as a bundle of magic items, traps, haunts, and monsters and the best thing is they take your own submissions, so people from around the world can use your ideas in their own campaigns. Finally it must be said that the staff are easy to reach and always willing to help out. I love AaW. The adventure layout makes it very easy for a GM to run an adventure; the linked stat blocks are awesome. The maps are top notch and the stories are varied and original. I enjoy keeping up with the blogs to give myself some ideas for my own games. I am an avid collector of Dungeons & Dragons 3.5 edition and Pathfinder. I love Adventureaweek.com. As a subscriber to the website, I have picked up approximately 25 pdf adventures. These adventures are for all different levels of play. I enjoy these adventures so much that I supported the Rise of the Drow Kickstarter campaign. I would suggest any Gamemaster that is looking for quality entertaining adventures look into a Adventureaweek.com subscription. I myself, want to get my hands on the print version of the adventure called "To Walk The Dark Road" as one of my next purchases. Oh yeah did I forget to say that they offer some adventures in print too? Check the website out and Happy Gaming! Adventureaweek.com is a brilliant site in idea, follow-through, and content. It allows RPG writers, artists and designers of all types to brainstorm, collaborate and in the end publish top end content. The humble price of the site allows access to a wealth of content, able to be used with a variety of rule sets and styles. The team at Adventureaweek.com are top notch and always willing and ready to lend a hand. Use Coupon Code: NEW2019 and get a free subscription to Adventureaweek.com. This gives you access to our entire catalog of flipbook adventures as well as 2 PDF, Fantasy Grounds, or Map Pack downloads per month.